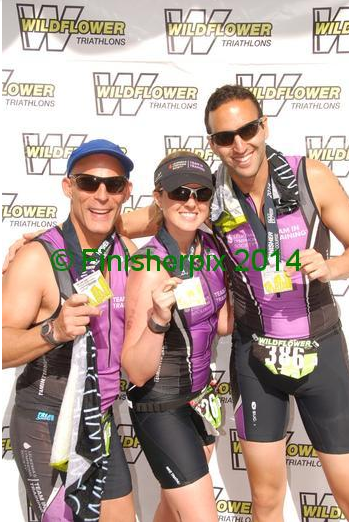 Race Report: Wildflower Long Course 2014 – Where's The Tofu? 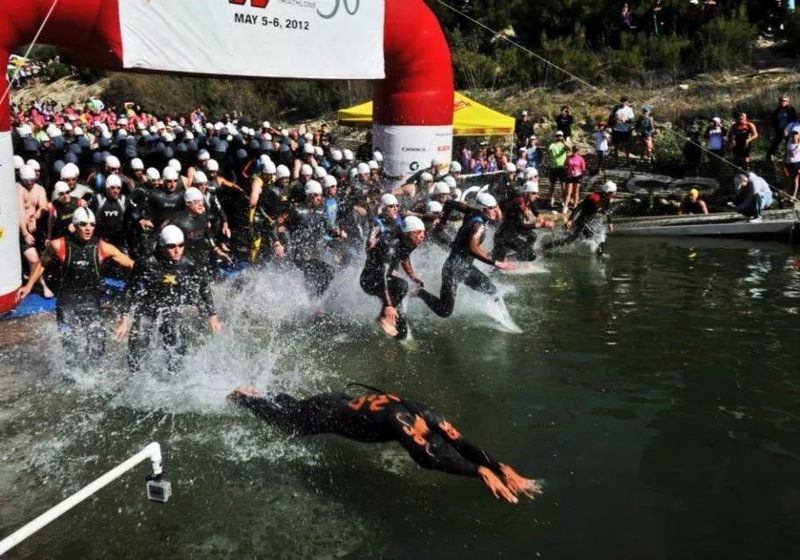 This was certainly a unique year at the “one and only” Wildflower triathlon: a new swim location, a slightly new run course, new bike racking procedures, and a whole new spin on the triathlon itself (swim, run, bike, run!). And to be honest, I enjoyed the changes! OK that steep boat ramp was killer and yes, the water was black… but I really liked warming up my legs during the 2.2 mile transition run to my bike. And I especially loved having “only” 11 miles to run instead of 13 after the hilly bike ride at the hottest point of the day. The race organizers did a great job communicating the changes and coordinating all of the volunteers and shuttles. Bravo! As for me, I had a great race and everything seemed to fall into place nicely. Hard work and preparation actually does pay off!! This was exactly what I needed to feel confident and motivated going into Ironman Lake Tahoe which is coming up in 4 short months. More detailed summary below if you’re interested! Money raised: $6,963 for the Leukemia and Lymphoma Society. Thank you!! I also made an exhaustive Google Doc packing checklist that I edited throughout the week to make sure I had thought of everything. We were setting up our transition area the day before the race so I had to make sure I had everything ready to go ahead of time. I also used meditation and visualization to help me stay confident for race day which is something our coaches recommended. 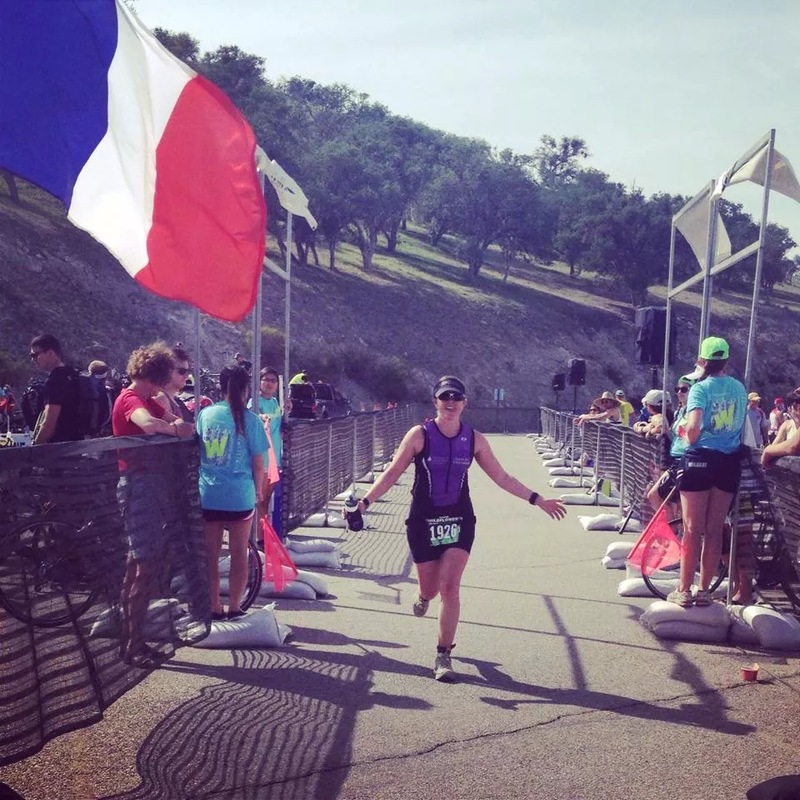 I spent 10-15 minutes a day in a quiet room to run through the entire race in my head. 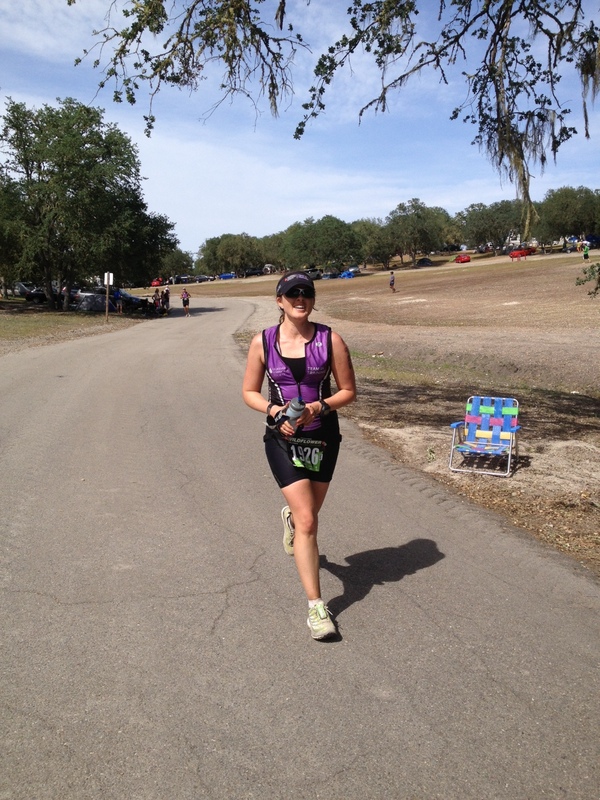 I visualized myself successfully completing each leg of the race and overcoming any obstacles. I used this technique in tennis quite a lot — I would visualize my serve going in and guess what? It usually went in. Visualization also helped me with my packing checklist, so it came full circle. Finally, I got a free bike tune to make sure everything was working properly (ironic because the only issue of the day was a mechanical!) More to come on that. Honestly, the only thing that was keeping me up at night about the race was the fear of getting a mechanical issue on my bike or a flat tire. I got a flat on a training ride a few weeks ago and it made me realize how slow and terrible I am at changing it. Note to self: practice this over and over until you can do it in 5 minutes!! On Friday morning I packed up my car (it was SO full!) and drove down to work for a couple meetings. Then it was a straight 2.5 hours down to Lake San Antonio! I had the windows down, music blasting, and 3 coconut waters and 2 water bottles within reach. 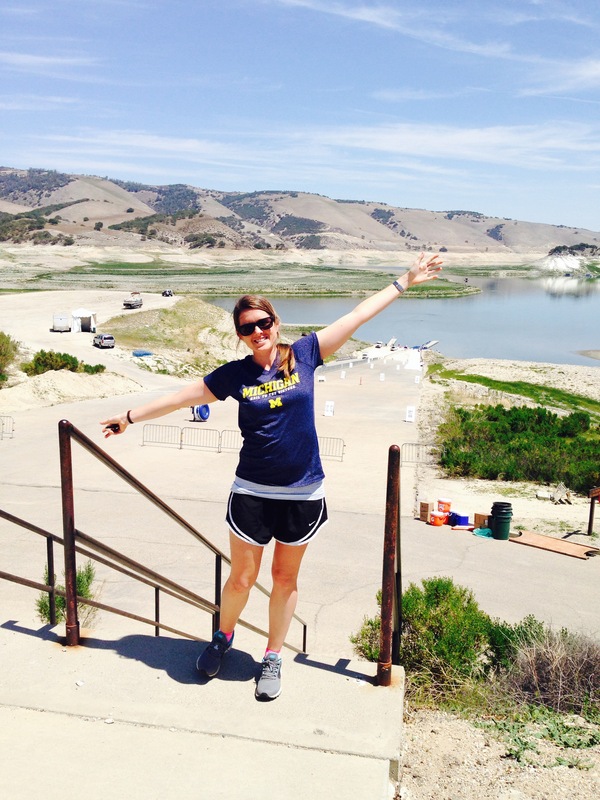 I kept up my hydration on Friday and took breaks to stretch my legs and change clothes along the way. The day before the race, checking out the swim start location at Harris Creek! 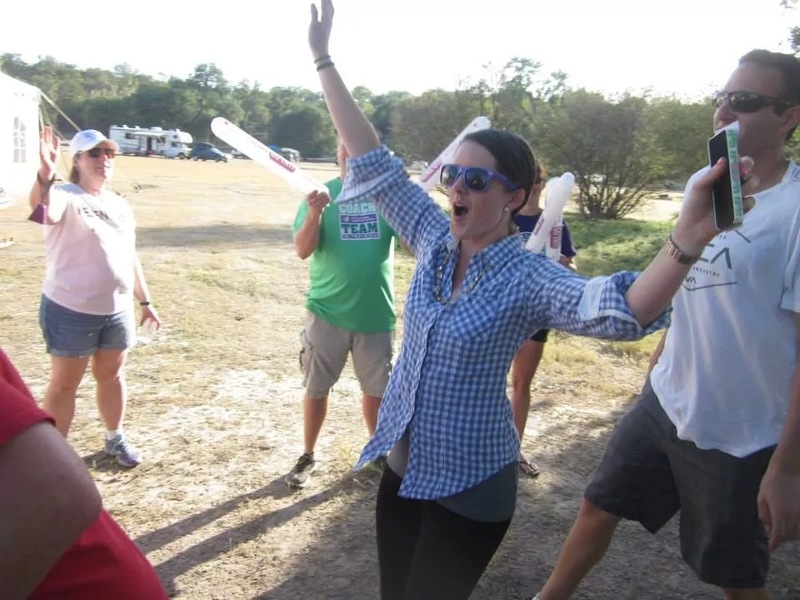 When I arrived to the campsite at Lupine Meadows I was welcomed by my smiling teammates and I was so happy to be there! I literally jumped up for joy in the 90-degree heat. Oh boy was it hot! 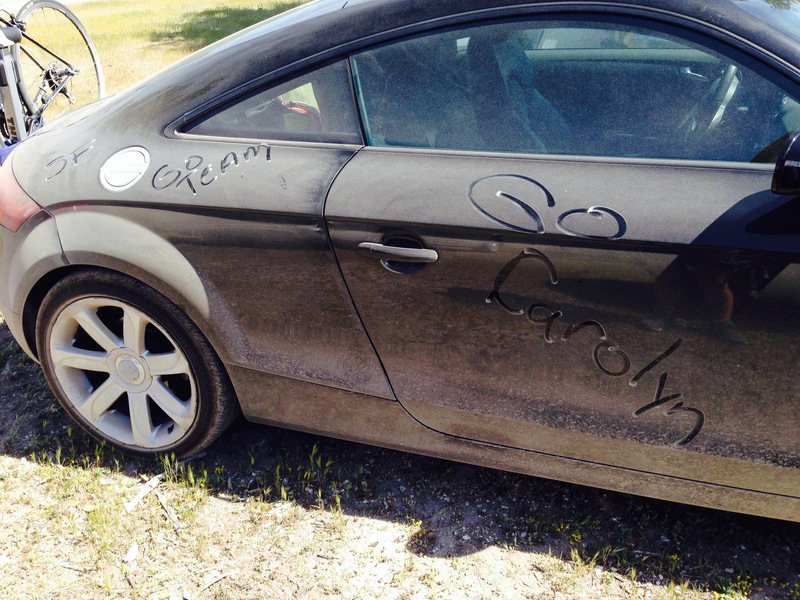 The whole campsite was really dusty and sandy so my car got dirty, but my teammate had some fun with it. At least my car USED to be black! The camping in general was pretty much the opposite of glamorous. It was dirty, smelly, and sweaty the entire time. We had no electricity, cell service, internet, e-mail, Facebook (gasp! ), hot showers, fresh water (had to boil everything), and the list goes on. But ya know what? I absolutely loved it! There’s nothing like disconnecting from the world for a few days and just enjoying nature, your friends, and the stars at night. I set up my tent (thanks for the help, guys!) then went down to Lynch to set up my transition area with my bike, running shoes, helmet and everything else I need to bike and run. This was different from last year where we set up everything the morning of the race. Then we had our Team in Training “Inspiration Dinner” where we heard from cancer survivors and got excited about the race. My team did so well with fundraising! We had 7 out of the top 10 fundraisers of all of TNT that weekend! And I was #3 top fundraiser. Thank you all!! This is the real reason we race, to find better treatments and cures for blood cancers. We then had a final group huddle with our coaches and it was lights out! I actually slept pretty well that night despite the inevitable nerves, the cold night and the weird animal sounds throughout the night. 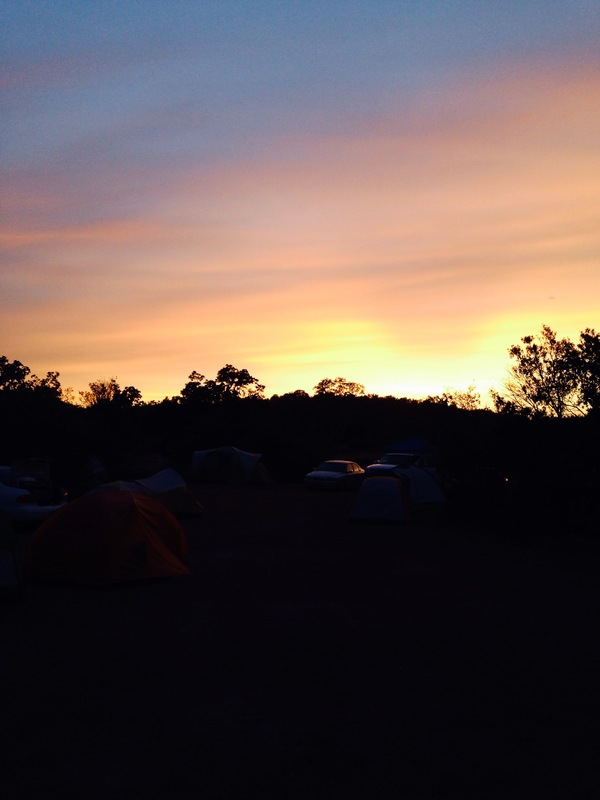 We woke up at 5:00am to the sound of some ‘lovely’ music blaring into our campsite. Gee, thanks coaches! But it was smart to wake up early because there is a lot to do on race morning. I got up and had my gluten free bread with almond butter and a banana washed down with hot coffee (thanks Nate!) and some water. Then we gathered our stuff and took a shuttle bus down to the swim start at Harris Creek, a new swim location this year. I was pretty calm the whole morning. I think it was because I felt very well-prepared for this race, and confidence goes a long way! 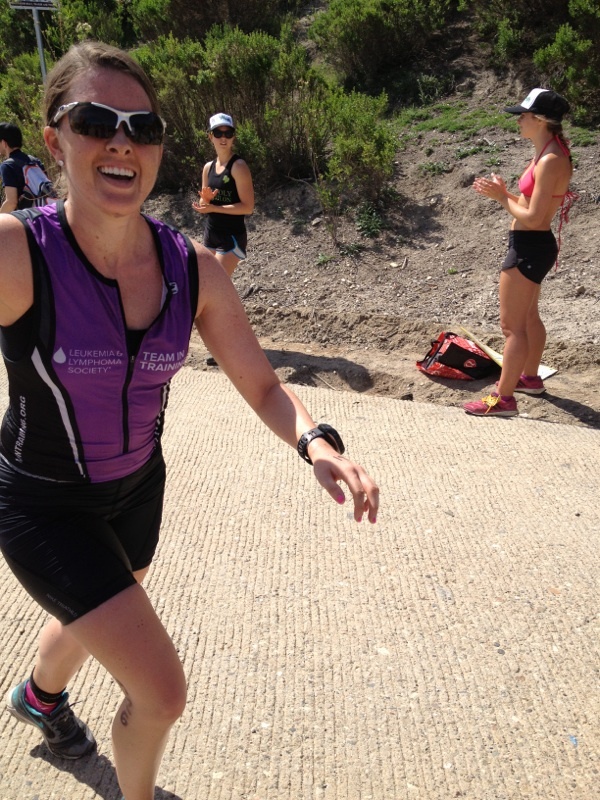 My wave didn’t start for another couple hours so I cheered on my teammates and chit-chatted with some tri friends that I saw (April, Barbara, Julia, Anne, Kit, Chrissy, Mark, Liz, and more!) and kept occupied. So great to see so many familiar and smiling faces down at the start area. I just love the whole triathlon community! Waiting with my awesome tri friends! I ate 3 Clif Shots ~ 20 minutes before the swim start with water, got a wetsuit wedgie from coach Tom and gave a final round of hugs to teammates. At 9:15am we were off!! Strategy: My strategy was to wait 30 seconds for the ~90 people in my wave to clear out first, and then start in the back because I know I’m a slower swimmer and didn’t want to get trampled. This worked out well and also helped calm any open water anxiety. The first 100 yards of the swim were pitch black. The water was so murky that you couldn’t see your arm in the water or anything for that matter. It was a little freaky! But then the water turned into a little bit clearer green color similar to Aquatic Park. I kept a really smooth, easy, and even pace for the whole swim and counted my strokes to keep my mind occupied. I typically look up and “sight” somewhere between 20 and 30 strokes to make sure I’m headed in the right direction. And then BOOM a kick to the nose. I thought I might be bleeding, but I just kept going and forgot about it. Results: Overall I did the 1.2 mile swim in 44 minutes which was a 5 minute improvement over last year. Not too stellar relative to other people in my age group, but I’ll take it! Improvement from last year: In past races I would get slowed down by people kicking me, punching me, or touching my feet because I would stop and look around first before continuing. But this time, I just immediately moved on. I also have been swimming 3x per week at a lower volume and working on drills and technique, as opposed to last year doing 2x per week of longer continuous swims. Technique is EVERYthing in swimming! Plus, I’ve been getting some great instruction from our coaches and doing a lot of open water swimming. Future: Looking forward, I do need some significant help with my swimming form. I think I will try and join my pool’s Masters program or even get some private lessons. I just want to be at least middle of the pack, and not getting trampled by everyone. Plus, having an easier swim means more energy for the rest of the day! I emerged from the water and the first thing I heard was Coach Tom telling me to wipe my face because I had a black “beard” from all of the gunk in the lake. Real cute, huh? I think he has a blackmail-style photo of that somewhere. Gross. I did say this weekend was the opposite of glamorous, right?! I power walked/jogged up the steep boat ramp to strip my wetsuit and grab my running shoes. My strategy for this 2.2 mile run was to take my time up the boat ramp and hills and not destroy my legs too early in the race. For the whole day in general my goal was to keep my heart rate at a steady pace without any major spikes (when possible!). After the boat ramp it was rolling hills on the beach, er, sand. I did try and visualize myself running on the beach, Baywatch-style, though. It helps to keep a sense of humor when you’re racing! Then it was another run up another steep boat ramp (they sure like the boat ramps…) into the bike transition area. I didn’t eat or drink anything during this leg because my stomach usually needs some time to settle down after the swim. This seemed fine. Strava output. I don’t remember running in the lake! Bike — ON YOUR LEFT!! I think I shouted “on your left” about a million times during the bike ride, especially in the first half of the ride. 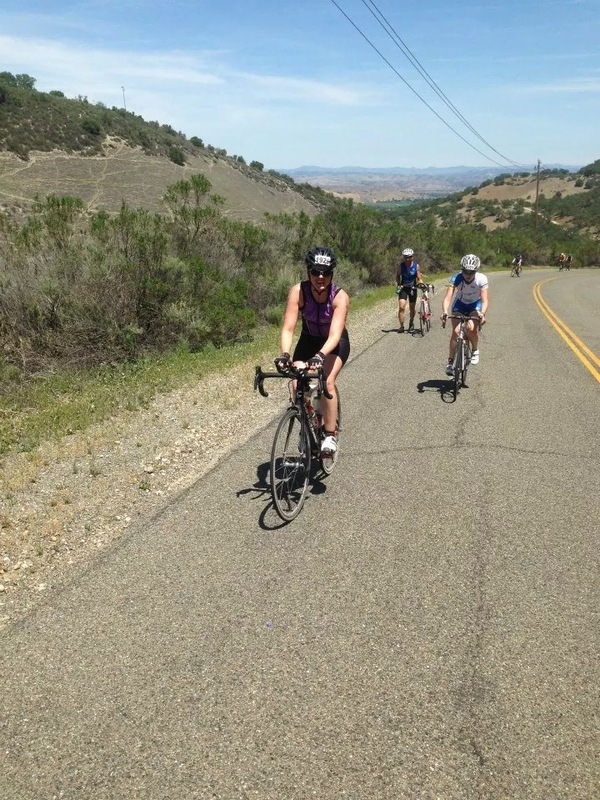 The bike leg is my strongest so I zipped past people and felt really strong for the entire 56 miles. It was hot and windy but I used my aero bars as much as possible to ‘cut’ through the wind to go a little faster and conserve my energy as much as possible for the run. The bike course is pretty hilly but the big and most-feared hill called “Nasty Grade” wasn’t so bad. 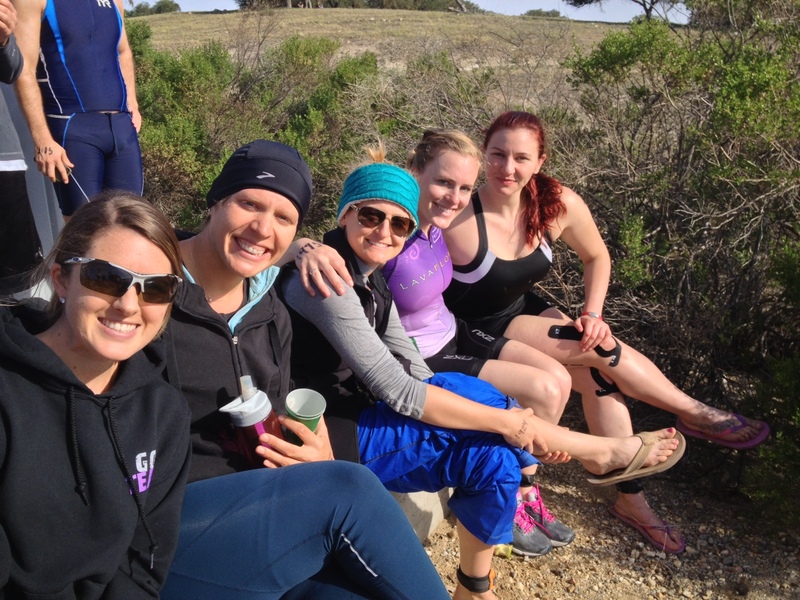 Our training in Marin (Alpine Dam) and the East Bay definitely paid off. There was even a man in a pink energizer bunny costume at the top to cheer us on. And no, it wasn’t a hallucination. Strategy: My strategy was to go out easy, especially the first couple miles up “Beach hill”. I just got into my easy gear and didn’t try and crush it. Same with Nasty Grade. Easy, controlled, and smooth was the name of the game on the bike. The course is absolutely gorgeous, very well supported, and I loved every second. I didn’t want to get off my bike! I did, however, have to get off my bike twice because I dropped my chain. I just fixed it and moved on. No big deal at all. But in case it had been a big deal, every single person that went by asked if I was OK and needed help. In fact one guy insisted on stopping and helping me! Did I mention how much I love triathletes? Such a supportive community! My gears were also acting a little weird; they would shift on their own which jolted me forward a couple times. I have to get that checked out asap! They had a mind of their own that day. Nutrition: I drank at least 6 bottles of water, dumped 3 on my head, drank 1 bottle of Nuun electrolyte drink, took 4 salt stick pills, ate a Picky Bar and a package of 3x Sodium (non alcoholic) Margarita Clif Shots. Results: 3 hours 36 minutes over 56 miles with 3,500+ of elevation gain which was an improvement over last year by 20 minutes! So happy about this! Improvement over last year: Last year they actually ran out of water on the bike course so I had to resort to nasty Gatorade for the last 20 miles. I also ate and drank way more than my body could handle in the heat which resulted in cramping on the run and some bad GI distress. So this year I decided to change it up and drink more water with easy-to-digest Nuun and salt tablets with Clif Shots that are tried-and-true. Seemed to work well! I also had been riding my bike consistently throughout the winter and it’s the sport that I love the most so any excuse I get to ride my bike I take it! 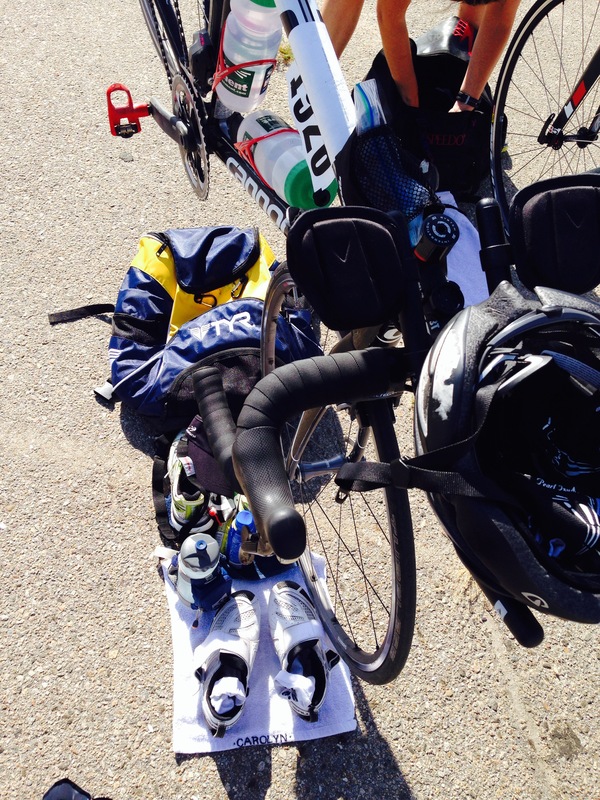 So between great training and better nutrition I really felt great out there on the bike. Best part of the run was seeing familiar faces early on! I saw Chrissy (former teammate and future IMLTer!) and chit-chatted with her for a bit, then saw Mark (GGTC social chair) who eventually zoomed by. But starting out the run with smiles and energetic people is a huge plus! I started out the run the only way you can at Wildflower… slow. The run starts with some rolling hills and some tough climbs. I power walked up the hills to conserve energy because 11 miles is a long way to run if your legs are toast! Strategy: my general strategy for the 11 mile run was to take it slow in the beginning, power hike up almost all hills, and then assess how I’m feeling at mile 5 and push it to the finish. My nutrition strategy was to take water and Clif Shots as needed depending on how my stomach felt. At this point it was 2-4pm which was the height of the heat so I just tried to stay in-tune with my body to make sure I was being smart with hydration. It was too hot out there to take any chances. The run was about 60% trail and 40% road so I decided to wear my trail shoes (Hoka One One Kailua) which was a great call for extra grip on those pesky and steep downhills. There was almost nothing flat about the run, you were either going up or down. During the run I also tried to talk to people if we were “power hiking” at the same pace. 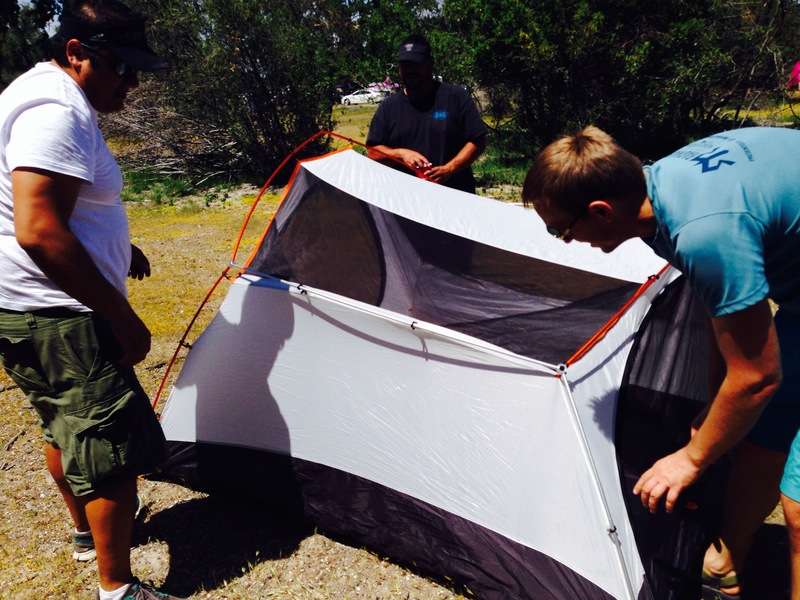 I talked with other Team in Training athletes, with Wildflower veterans, and people who were struggling. It was fun to get to know different people out there. And I tried to give a “good job!” to anyone that passed me. I remember jokingly asking one person “are there ANY down hills to this course?” And the response was ” haha yes, at Lynch”. Lynch is the last mile and it’s one long straight downhill. It sounds nice but it can be a killer on your quads if you’re not careful. This was the only place where I had some cramping — a little side stitch in my stomach but went away once I got to the finisher’s chute. Finisher’s chute! Thanks for the photo, coach Kim! Result: 10.9 miles with 1,000 ft of elevation gain in 2 hours and 2 minutes, for a total run time of 2 hours 22 minutes, which was 22 minutes (wow that’s a lot of twos!) faster than last year. Super happy about this! Nutrition: I didn’t consume too many calories on the run because I didn’t think I needed it and I was afraid I was going to upset my stomach. 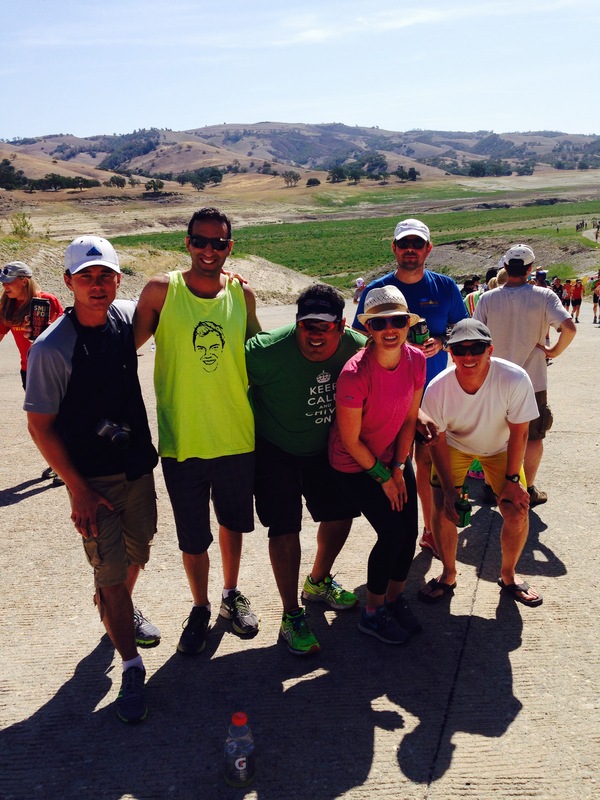 I took 1/2 package of Clif Shots and I drank water at every aid station and a little bit of Gatorade at 3 stations. And I actually felt completely fine and never felt like I was bonking at all. Improvement over last year: Last year I had some bad side-cramps and some general stomach issues, mostly because I think I over-consumed because I was scared that the heat would lead me to bonk. I also in general have become a faster runner by consistently going to track and doing hill repeats every week. I really think this paid off. I still have some room for more improvement for 2015 if I do more trail running. I was overcome with emotions at the finish line. I was absolutely shocked when I saw that I broke 7 hours given that my goal was just to do better than last year (7 hours 45 minutes)! I couldn’t wipe the smile off my face! The race organizers put a medal around my neck and an ice cold towel on my head. Ahhh amazing!! Then there were hugs all around for my coaches and teammates who were in the finisher’s area. Coach Nate handed me some strawberries and Gatorade and I sat in the shade with Jason to recover and cool down a bit. After the race I grabbed my bike and gear and went back to our campsite to shower and get ready for our Victory dinner with Team in Training and then our team bon-fire and pep talk for the Olympic distance racers who were competing on Sunday. Saturday night wasn’t too crazy, just had a celebratory beer, heard about everyone’s races, and just chilled out under the stars. It was awesome. The next morning I got up early, had some toast and then headed down to the expo area for a much-needed massage (so painful)! Then we cheered all of our teammates who raced the Olympic course. Then I drove back to San Francisco! I was so sad it was all over!! 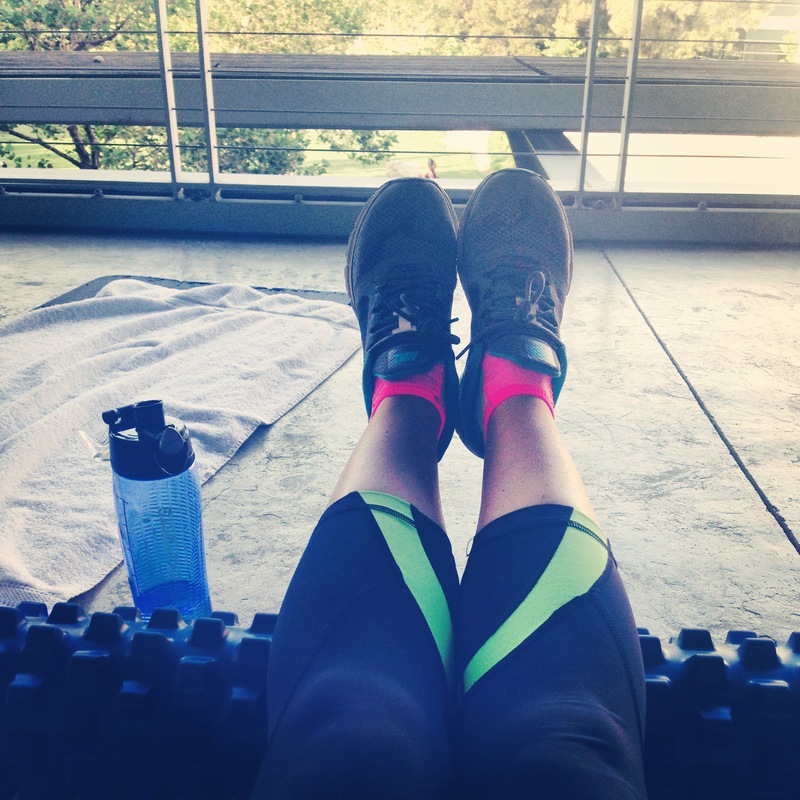 Recovery foam rolling session. Painful but it helped! All of the amazing, incredible, knowledgeable, thoughtful Team in Training Coaches who helped me get to race day prepared to conquer this race. I could write a whole blog post about how amazing you all are. Thank you so much. All-in-all I’m extremely happy with my race. I felt strong the entire day, I never felt sapped of energy, I smiled and thanked the volunteers a lot, and just had a massive amount of fun. I was definitely well-prepared for the race (thanks coaches!!) and I’m really excited to use this confidence and motivation to power me through these next 4 months of Ironman training! Woohoo!!!! Congrats on a great race and what an awesome improvement over last year! I am so intrigued by Wildflower, but I’m not sure I could deal with camping beforehand – eek! Awesome work!!! Thanks @swimmykimy!! Yeah the camping was a little challenging but I think it made us all a little tougher. Definitely a fun overall experience though and I highly recommend it at some point! Congrats on that tough course! I was also told I had a beard when I left the water – so ridiculous and kind of embarrassing! Thank you! Yeah the black beard was nasty! 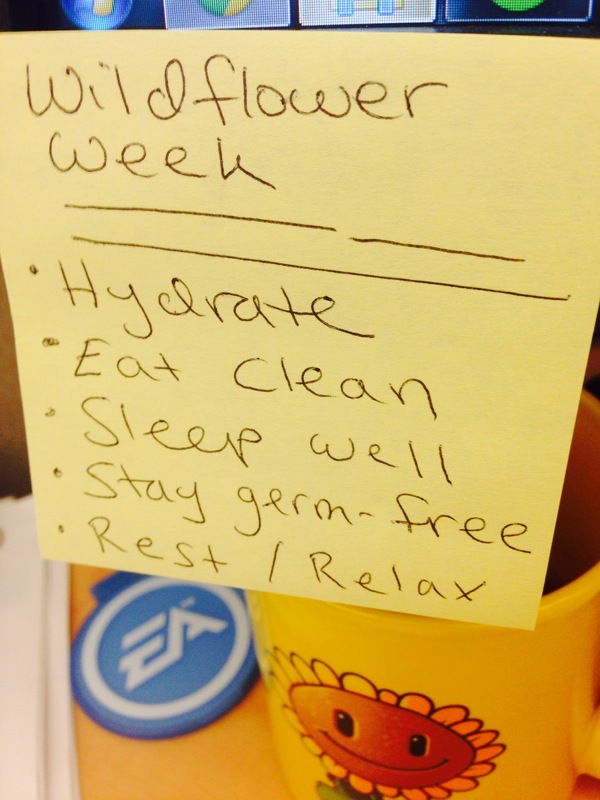 Pingback: Week 19: Wildflower Recovery and a Tough Weekend | Where's the Tofu? 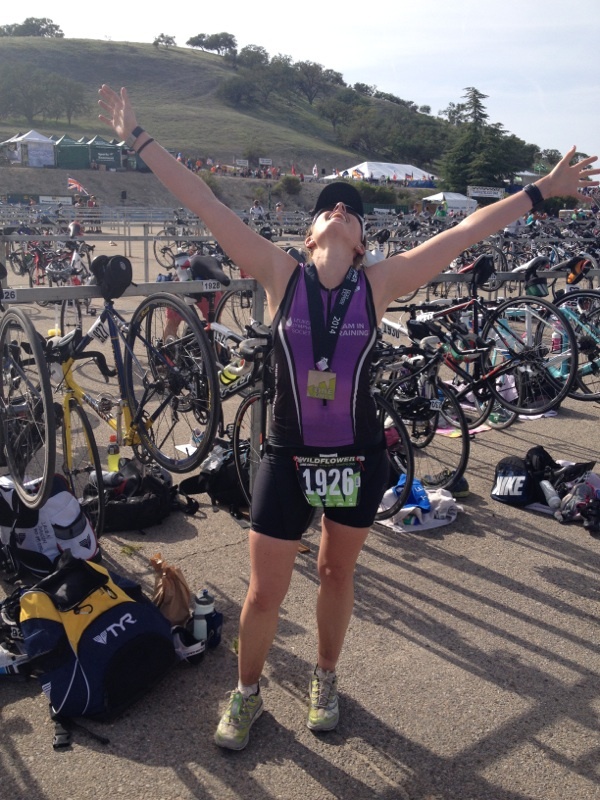 Pingback: Bring it, Ironman | Where's the Tofu? Pingback: All About That “Base” | Where's the Tofu?